How long will your battery charge last? Time [ hours ] = Battery capacity [Ah] / Current [A]. For example, a 10 Ah battery will power a 0.1 A load for 100 hours. Note: An embedded system may need only an average supply of XmA but may require as much (X+Y)mA at peak loads. System must be efficiently designed. How big a battery do I need to power a load for a given time? 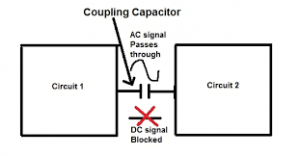 A decoupling / bypass capacitor is a capacitor used to decouple one part of the electrical network from another. Noise caused by other circuit elements is shunted through the capacitor, reducing the effect it has on the rest of the circuit. It’s hard to demonstrate whether decoupling capacitors are really necessary, but it never hurts to include them. As a general rule, every IC should have decoupling capacitors at every power pin. 0.1uF is a standard value, but you need to check the datasheet. The job is to supress high-frequency noise in power supply signals. They take tiny voltage ripples, which could be otherwise harmful to delicate ICs, out of the voltage supply. Decoupling capacitors connect between 5V, 3.3V and ground. If somebody says they didn’t use decoupling capacitors and it works fine, that’s like saying they only put 2 lug nuts on each wheel, and it works fine. Notice LM7805 with two decoupling capacitors. Note: Every component should have a decoupling capacitor for every power-supply pin. What is more dangerous – current or voltage? Why do we see multiple bypass capacitors? RS232C has loads of problems and limitations. Getting any two RS232C devices to talk is not as simple as it could or should be. You need the right cable with right sort of connectors, and then you need to manually coordinate the communication parameters such as data rate, parity, and handshaking. You need to make your product as easy to use as possible. Universal Serial Bus (USB) is the solution. It allows peripherals and computers to interconnect in a standard way with a standard protocol and opens up the possibility of “Plug and Play” for peripherals ( Yes, RS232C is an endangered species now! ). USB 2.0 is fully compatible with USB1.1. USB is a high-speed bus that allows up to 127 devices to be connected. When a new device is connected, the host operating system determines what software driver to use for that device. The device is then assigned a unique address, and its internal configuration is requested by the host. USB is a shielded, four-wire cable to interconnect devices on the network. Controller Area Network (CAN) is a network for industrial applications, where a conventional network just won’t do. CAN is suited for electrically noisy and harsh conditions and is the network of choice in electrically severe environments. Through the late 70s and 80s, the complexity of automotive electronics grew considerably, with active suspension, automated lighting, air-conditioning and security. A considerable amount of information exchange is required. The conventional method was point-to-point wiring, which provided discrete interconnection between each subsystem. You cannot have long wiring and dozens of connectors which will add cost, unnecessary weight. The network must provide high noise immunity and error detection and handling, with retransmission of failed packets because automotive electrical environment is very noisy. Bosch developed CAN in Europe in the late 1980s, originally for use in cars and is now an international standard. IrDA (Infrared Data Association) is the infrared transmission standard commonly used in computers and peripherals. It is a consortium of over 150 companies that maintain and develop the standard. The basic purpose of IrDA is to provide device-to-device communication over short distances. With IrDA, no cables are required, and the device communicating will be physically close, so relatively low power transmission are all that are required. There are regulations guarding the maximum level of IR radiation that can be emitted. Also, the two devices that are to communicate will be physically pointed towards each other prior to use. It can also be assumed that only devices will be communicating and that their proximity will exclude interference from other IrDA devices. Two IrDA devices may be communicating at one end of the desk, while other two devices are communicating at the other, with no problems at all. You can’t see IR output of a remote control with the naked eye, but if you point a camcorder at it, you can. The CCD imager inside the camera is sensitive to IR as well as visible light. To further increase their ability to image at night, some camcorders have IR lights on the front to illuminate the darkness, yet be invisible to people looking on. LHi968 : Here. It is one of the best in the market and graded for lower white light sensitivity. These capacitors include both aluminium and tantalum electrolytics. Tantalum electrolytic capacitors have larger capacitance per volume ratios when compared to the aluminium ones. A majority of these capacitors are polarized. Electrolytic capacitors, when compared with nonelectrolytic ones, typically have greater capacitances but have poor tolerances ( extent to which the actual capacitance is allowed to vary from its nominal value ), bad temperature stability, high leakage and short lives. 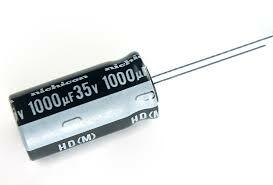 A very popular nonpolarized capacitor that is small and has poor temperature stability + poor accuracy. It contains a ceramic dielectric and is often used to bypass and coupling applications. 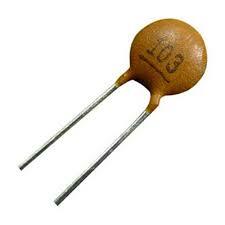 Popular nonpolarized capacitor that has low leakage current but poor temperature stability. This is an extremely accurate device with very low leakage currents. 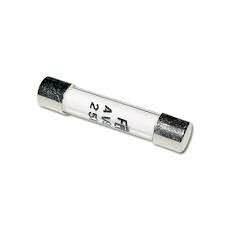 These capacitors have small capacitances and are often used in high-frequency circuits like the RF ones. They are very stable under variable voltage and temperature conditions. 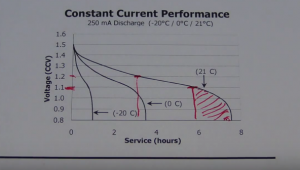 What is the effect of cut off voltage on battery capacity? A well designed product will have as low cut off voltage as possible and will operate all the way down. 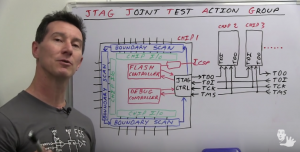 JTAG stands for Joint Test Action Group. You may have heard the term or used in terms of programming a microcontroller or an FPGA or as a debugging interface but, in fact, it wasn’t even originally designed for the above mentioned tasks. Manufacturers had real lot of trouble in testing the assembled PCBs ( packages got very dense ). They wanted to come with a standard to embed some hardware into the chips so that we can use them to test them. More details in the video. Note: A very useful thing to include in your design is a serial interface, even if you don’t need a serial port for the final application. A serial port is extremelly useful for printing out diagnostic and status information from the system. The other mandatory debugging tool is the status LED. A flashing LED can tell you volumes about a machine. They can be shaped, bent or twisted. Both rigid and flex circuits serve, the same function, which is connecting electrical components. Flex circuits may eliminate the cost of connectors or wire harnesses. MAX603 gives you a 5V output and MAX604 gives you a 3.3V output. They use far less quiescent current than LM78xx and are good small regulators. They can provide up to 500mA of current and can operate from an input voltage of between +2.7V and +11.5V DC. They have built-in protection in case you and consume as little as 15uA of current for their own use. They are good for low-power applications. It is a linear regulator that can operate from a supply range between 4V and 28V. It is tiny and capable of supplying 30mA of output current at either 3.3V or 5V. 30mA is not much current, but for very small applications, it may be sufficient. It also has a shutdown input, allowing an external system to power it down. One use of this regulator could be as a power source to subsystems within an embedded system, allowing the host processor to turn them off when not in use. For higher-current situations, MAX724 can supply up to 5A form an input voltage of 8V and 40V. Its output is adjustable form 2.5V to 35V and quiescent current is 8.5mA. Also, its only a step down regulator. LM78xx can provide an output current upto 1mA and as much as 2.2A peak, with a quiescent current of between 5mA and 8mA. For negative output voltages, use an LM79xx which is used in exactly the same way as an LM78xx. Switching regulators get their name because they switch a power transistor at their output. They waste less power during the conversion process when compared to linear regulators. However, their drawback is that they require more external components ( such as inductor ) and take up more space. 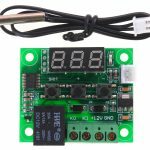 Unlike linear regulators, they can step / down voltage and they can also invert ( For instance,unregulated 6V can be converted to regulated -12V ). 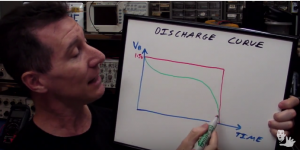 Charge pumps ( MAX3222 ), like switching regulators, can step up/down/invert voltages. Unlike switching regulators, they require no external inductor but have limited capacity to supply current. What are the basic elements in a power supply? 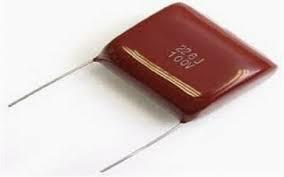 Input Transformer : Is used to transform the incoming line voltage down to the required level of the power supply. What are various forms of power supplies? Unregulated : It simply consists of rectifier section followed by a capacitor and inductor smoothing without any regulation to steady the voltage. It was used many years ago. Note: In choosing a regulator(yeah, off-topic), select one that can supply the appropriate output voltage / the required current needed by your system, yet has the lowest quiescent current. What are Fuses and Circuit Breakers? They are devices designed to protect circuits from excessive current flow, which are often a result of large currents that result from shorts or sudden power surges. A fuse contains a narrow strip of metal that is designed to melt when current flow exceeds its current rating, thereby interrupting power to the circuit. Once a fuse blows, it must be replaced with a new one. A circuit breaker is a device which can be reset after it “blows”. When the curretn flow exceeds a breaker’s current rating, a bimetallic strip heats up and bends which “trips” the latch. What are the various types of fuses and circuit breakers? These are made by encapsulating a current-sensitive wire or ceramic element within a glass cylinder. Fuses may be fast-acting or time-lagging. Current ratings range from around 1/4 to 20A, with voltage ratings of 32, 125, 250V. These are fast-acting fuses with bladelike contacts. Current ratings range from 3 to 30A, with voltage ratings of 32 and 36V and are colored coded according to the rating. Some have manual resets, while other have thermally actuated resets. Main-line circuit breakers are rated at 15 to 20A and smaller ones may be rated as low as 1A. Circuits are typically enclosed in either an aluminium or plastic box. Aluminium enclosures are often used when designing high-voltage devices, wherea the plastic ones for lower-voltage applications. Also, ground it. Correct definition: When two or more systems are in thermal contact , internal energy flows from the system at higher temperature to the system at lower temperature. The “internal energy in transit” between two bodies is called heat. Correct definition: Physical property which determines the direction of flow of heat when two bodies are brought in contact. 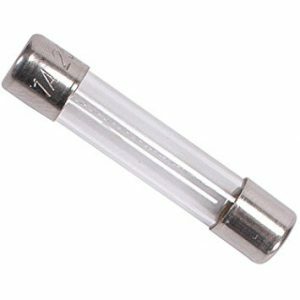 What is a Slow-blow Fuse? 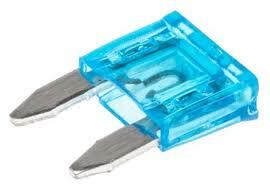 It is a type of fuse which can handle a temporary surge current which exceeds the current rating of the fuse. It does not blow for a temporary surge current; it must receive a sustained elevated current above its current rating. Why Gold Plated Probes Matter? 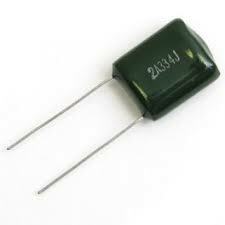 A capacitor which is used to couple or link only the AC signal from one circuit element to another. The capacitor block DC component and the value of the coupling capacitor depends on the frequency of thw AC signal being passed through. A Zener Diode is a device that acts as a typical pn-junction diode when it comes to forward biasing, but it also has the ability to conduct in the reverse-biased direction when a specific breakdown voltages in the range of a few volts to a hundred volts. They are frequently used in voltage-regulator applications. EMI can be in the form of conducted EMI, which means the noise travels along electrical conductors, wires or components such as inductors, capacitors. Electrical noise can be in the form of radiated EMI, noise that travels through the air which is controlled by providing metal shielding. Most electrical and electronic devices can generate and/or be affected by EMI. Sources include motors, microwave ovens and SMPSs. High speed switching in SMPS generates unwanted EMI witihn the SMPS. It is the function of an EMI fiter to keep any internal generated noise witihn the device and prevent any AC line noise from entering the device. They are devices that interconnect two circuits by means of an optical interface. For example, a typical optoisolator may consist of an LED and a phototransistor enclosed in a light-tight container. The LED portion of the optoisolater is connected to the soure circuit, whereas the phototransistor portion is connected to the detector circuit. One circuit can be used to control another circuit without undesirable changes in voltage and current that might occur if the two circuits were connected electrically. 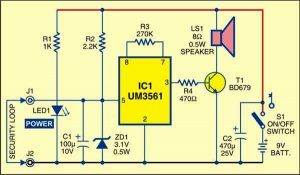 Interrupter is a device that contains an open slot between the source and sensor through which a blocker can be placed to interrupt light signals. Relays are electrically actuated switches. The three basic kinds of relays include mechanical, reed and solid-state relays. Reed relays and solid-state relays tend to get damaged by surges in power. Mechanical Relay- A current sent through a coil magnet acts to pull a flexible, spring loaded conductive plate from one switch contact to another. They are designed for high currents (2A-15A) and relatively slow switching (10-100ms). Reed Relay- Consists of a pair of reeds (thin, flexible metal strips) that collapse whenever a current is sent through an encapsulated wire coil. They are designed for moderate currents (500mA-1A) and fast switching (0.2-2ms). Solid-State Relay- Wide range of current ratings + fast switching speeds (1-100ns). DC-driven coil- Place a diode in reverse bias across a relay’s coil to eliminate voltage spikes. Check transient suppressors. How to make an ‘intelligent’ bicycle lock? By attaching two transistors as shown above, a larger current-handling, larger Hfe equivalent transistor circuit is formed. The combination is referred to as Darlington Pair. 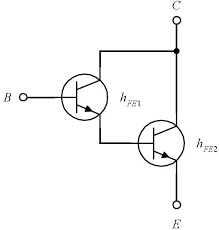 The equivalent Hfe for the pair is equal to the product of the individual transistor’s Hfe values. They are used for large current applications and have slower response times ( it takes longer for the top transistor to turn the lower transistor on and off. They hve twice the base-to-emitter voltage drop of 1.2V instead of 0.6V. The circuit above uses BD679 (Datasheet : Here). Make sure you see the datasheet of your own manufacturer. 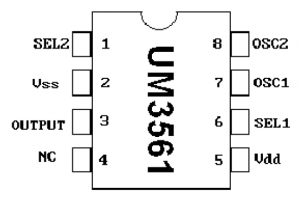 UM3561 is a CMOS LSI IC commonly used in alarm and toy applications. It is able to generate police siren, ambulance siren, fire engine siren and machine gun sound just by changing some connections. It’s a low power IC which can work down to 2.4V. Datasheet : Here.